Don’t miss this review of this Kickerstarer-funded series! 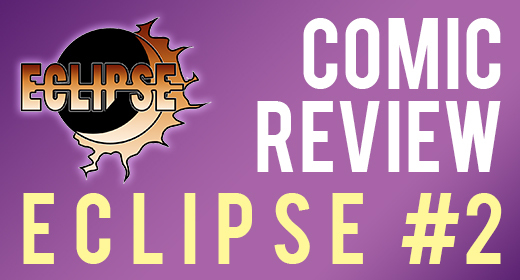 Like Ronnie said in his review of Eclipse #1, when I heard that this was a Kickstarter comic, I wanted to run for the hills (perhaps that’s not exactly what he said, but I was wary to say the least). Turns out I shouldn’t have been. It was a good read. Typically I don’t go for superhero comics. I stay away from them because it’s just not my groove. In reading Eclipse #2, though, I found myself enjoying the story and caring deeply about the characters, which is obviously Mr. Talbott’s intent. I won’t spoil anything, but speaking as someone who was ready to not enjoy the comic at all – I was pulled in. I had questions from the start about all the characters, and like any good comic, the questions that were answered just raised new ones. It was quite magnetic. In the review for #1, Ronnie mentioned the art being sometimes jarring. I see his point, but I also agree with the point he made that the art style largely complements the characters. Some of the flashback scenes feel almost surreal, as though we are in Keith’s actual memory and not just a retelling of it. Whether or not that was the original intention, I dug it. The English stickler in me would be remiss if I didn’t mention that there are faults in the grammar and occasional errors in punctuation, but it’s nothing a bit of fine tuning wouldn’t cure – I’ve seen much worse. It wasn’t enough to distract me. As a whole, I enjoyed the second offering in the Eclipse universe. I am curious to see what Raze has to offer, and to find out more about how Keith became Eclipse. I don’t give out stars or directional thumbs, but I hope to see more of this series. @JustUsGeeks @emilysteen thanks for taking the time to review!